Grilled cheese sandwiches are an easy kid-pleaser: crunchy, warm, gooey, and satisfying. It doesn't take much to elevate a good-enough grilled cheese to a spectacular sandwich. The trick is to play with your food. We set out to create a better sandwich (the winner is below) with a build-your-own grilled cheese bar: several varieties of cheese, breads, spreads, and toppings. It's so much fun with kids. Encourage them to smell the different ingredients, then taste them. Talk about the textures. Let them nibble pieces of bread, scoop up shredded cheese, dip a (clean) finger in a spread. One of our boys was surprised that the "stinky" cheese -- Appenzeller Swiss -- was so tasty. 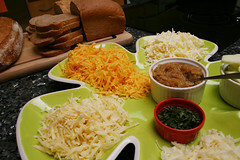 The kids ended up building plain cheese sandwiches, but they enjoyed exploring the options. And next time they might try something new. We had near consensus on a favorite combo: hearty bread -- either rye or the homemade light wheat sage bread -- with fig jam or chutney, caramelized onions, chopped sage, and Appenzeller and Monterey jack cheese. I liked mine with apples; my mother, who was visiting us, preferred a slightly spicy mango ginger chutney from Trader Joe's to the sweeter fig jam. 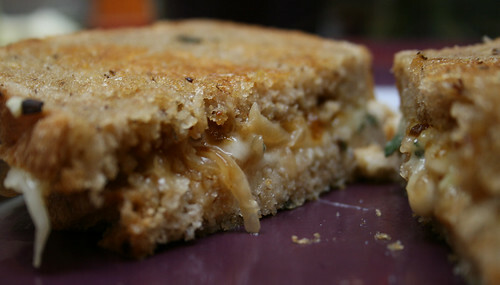 Have a favorite grilled cheese sandwich? Share it in the comments! To make caramelized onions, I like this Cooking Light preparation: Heat oil in a skillet over medium-high heat. Add thinly sliced white onion and stir frequently for about 15 minutes, then lower the heat and add a pat of butter. Cook about half an hour, or until the onions are browned and the liquid is gone. Add a bit of salt and pepper. Freeze extra in a flattened plastic bag so it's easy to break off a piece to thaw. There are no measurements here: Use as much or as little of each ingredient to suit your taste. Spread one side of each slice of bread with fig jam. Lay one slice on plate, jam side up, and top with a thin layer of cheese, onions, sage, and more cheese. Top with second slice of bread, jam side down. Spread butter on the top and bottom slices. Lay sandwich in pan. Cook until golden brown; flip and cook other side. If the sandwich is browning quickly and the cheese hasn't yet melted, press the sandwich lightly with a spatula. Wow. I've always been partial to grilled ham and cheese, but I'll have to try the jam and apples versions! Fruitier jams like apricot work nicely too. Have fun!